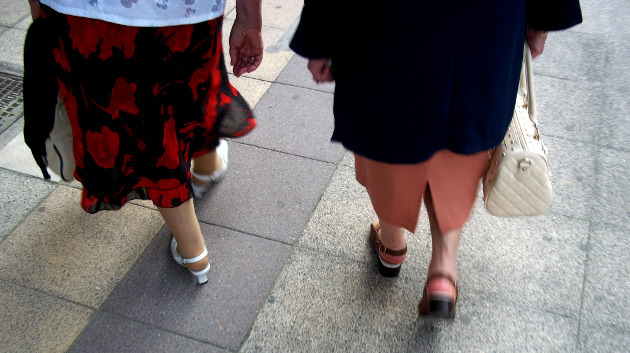 We’ve made the effort to convert our blog about Oviedo and Asturias into an e-book. 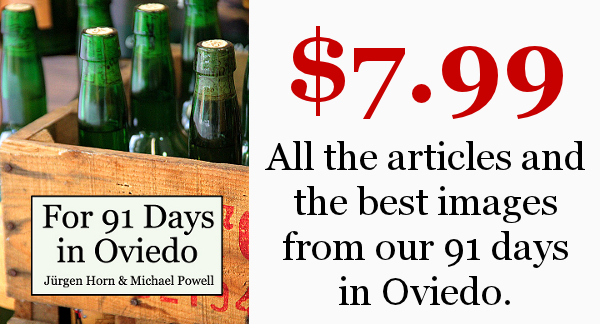 For 91 Days in Oviedo contains all of our articles and a selection of over 150 of our best pictures. With an index sorted by category, links to the original blog posts, and cross-references spread throughout, the e-book is a perfect companion for a trip to Oviedo. 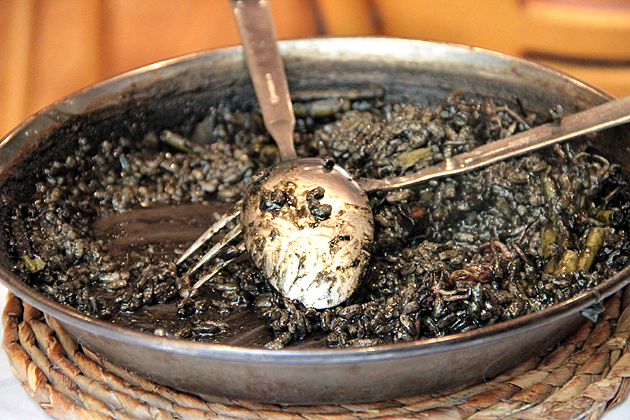 On Calle Cimadeville, just past the open arch of the Ayuntamiento building, La Más Barata is one of Oviedo’s most famous and popular restaurants. The road between Colunga and Arriondas winds through the Sueve mountain range. 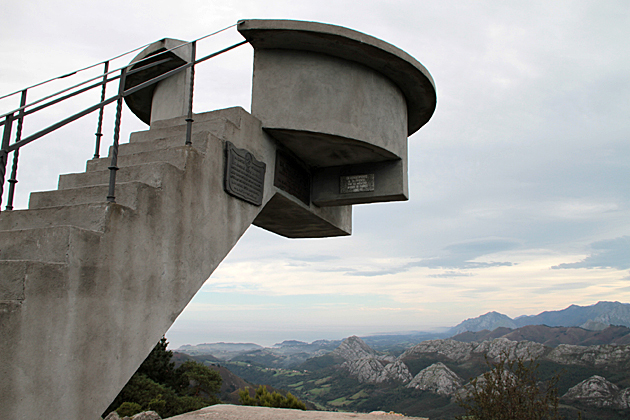 Midway through the drive, is a viewpoint called the Mirador del Fito, which offers an incredible view of the ocean, valleys and the Picos de Europa in the distance. Picture, for a moment, Manhattan. Important people dressed in suits rush hurriedly down sidewalks, juggling their cellphones, briefcases and coffee mugs. There’s no time to waste, and each confident stride has an extra kick of energy; if you’re faster than the other guy, you’ll get there first and win the contract! Get the promotion! American Dream coming through, make way! 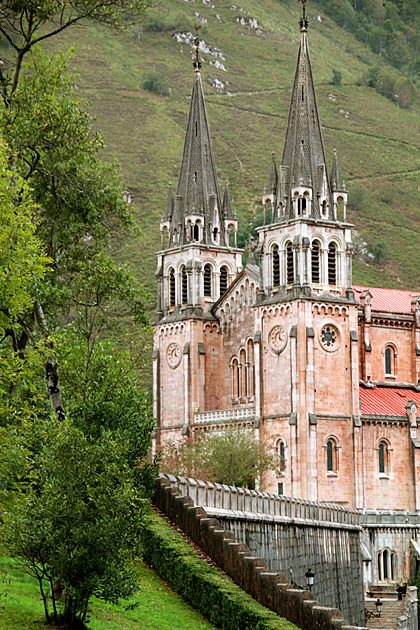 Oviedo may be the political center of the Principality of Asturias, but Covadonga is its spiritual heart. This mountain sanctuary near Cangas de Onís is where King Pelayo led a ragtag bunch of Christians to victory over a much larger Muslim force in the 8th century. It was Christianity’s first triumph since the Moorish conquest of Iberia, and marked the beginning of the 800-year Reconquista. 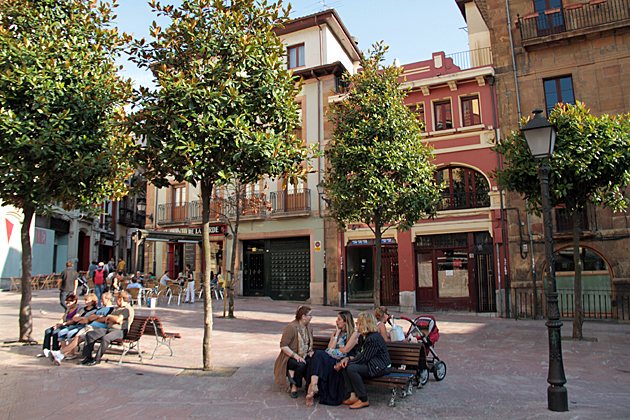 Found near the historic seat of the University of Oviedo, the Plaza del Riego is a small, triangular shaped plaza in the center of the city, which buzzes with activity from morning until evening, when its outdoor terraces are consistently packed. 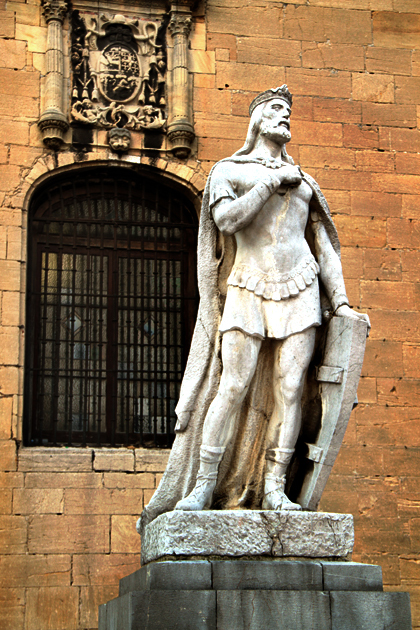 King of Asturias for 51 years, from 791 until his death in 842, Alfonso II el Casto had an impact on Oviedo that has barely diminished over the course of the centuries.